(The Princess and the Plum Wine originally was written for my stunt writing class in a response to a prompt to write about our first memory of a meal.) This time of year brings back such fond memories…. This probably isn’t my first memory about a meal, but it is likely the first memorable one. I was nine years old and my family was busy preparing our house for Passover and the many guests who would be coming for dinner. Of course my maternal grandparents and my paternal grandmother who lived nearby would be there, as well as my favorite uncle, David, and his wife, my Aunt Marion. New neighbors Harry and Esther were also invited. My younger brother Alan was five. So, why was this night different from all other nights? You really want to know, don’t you? All the holiday cleaning and cooking had been complicated by the fact that yours truly had been sick all week, and during the past couple of days I developed a horrible cough that proved resistant to numerous pharmacological and natural cures and as a result, kept the entire family awake for the past two nights with my incessant hacking. Harry and Esther brought, as their contribution to the dinner, a gallon jug of homemade plum wine. My dad walked around the well-laden table with the heavy jug, pouring some into each glass. Everyone commented on how sweet and delicious the wine was. 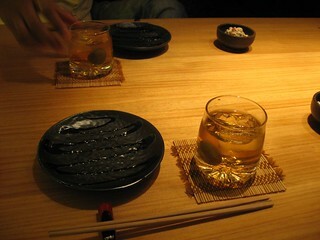 I had never sampled plum wine before; it tasted as sweet as the effervescent punch they serve at kiddie birthday parties. “Do you like it?” Esther asked. I nodded. “Here, have some more,” my dad offered as he filled my glass to the brim. I gulped the syrupy liquid as my mother served the first course, that golden chicken broth with fluffy matzoh balls and a carrot or two that I left in the bowl. Wonder of wonders, my grandmother noticed that my coughing had stopped. “Give her some more, so maybe we can get some sleep tonight finally,” my dad ordered his brother. “Are you sure this isn’t too much for her?” My uncle questioned, wrinkling his brow. “Naw,” my dad cut him off, “it’ll do her good.” Whenever the glass moved toward empty, my dad topped it off. (I think you know where this is going.) Nine-year-old’s aren’t known for their ability to hold their liquor. Suddenly it hit me. I started giggling uncontrollably. I don’t know what was funny, except the ladies were busy clearing the plates and replacing them with the next course. My mother gave me, “the look.” I responded by crumpling up a napkin and throwing it at her. That was so much fun I crumpled up another napkin, and this time threw it at my surprised younger brother, laughing hysterically as I did so. My mother escorted me into the kitchen, and this time my dad was the recipient of the dirty look. “This is your fault Raymond.” So, I might be persona non grata at the dinner table, but that didn’t stop me from throwing more napkins, used Kleenex, or anything else I could get my hands on at my mother every time she came into the kitchen. Since everyone liked it so much, Harry and Esther brought the same gallon jug of homemade plum wine over again for dinner the next year. This time I was only allowed one small glass, under the watchful eye of my mother, of course.